What is the Mock Prison Riot? The $50 registration fee is NON-refundable under any circumstance. If you are an exhibitor and you have paid your booth fee, you may cancel your booth for a refund until 60 days prior to the start of the event. If you cancel within 60 days of the start of the event, you will not be reimbursed for your booth fee. The $50 registration fee is NON-refundable regardless of when you cancel your booth. Registration requires each person to have his or her own unique email address. If you are registering a group from your organization/agency, you must enter a unique email address for each person. Entering the same email address for every person in your group that you are trying to register will result in the system generating a message stating that the person is already registered, and you will not be able to progress through the registration process. Your booth space will be reserved upon receipt of payment. Each booth comes with one table, two chairs, and consists to an 8 x 10-foot area of operation. You may purchase additional tables and chairs for your booth space. Additional tables are $50 each. Additional chairs are $25 each. For One Booth, you may purchase up to one additional table and two additional chairs. For Two Booths, you may purchase up to two additional tables and four additional chairs. For Three Booths, you may purchase up to three additional tables and six additional chairs. PLEASE NOTE: The $50 registration fee for each attendee is NON-REFUNDABLE under any circumstance. Booth fees are refundable if cancellation is received no later than 60 days prior to the start of the event. There will be NO REFUNDS issued for booth fees for cancellations received after the designated 60-day cancellation deadline. If you have purchased additional tables and chairs, these items are considered part of your booth fees and also are NON-REFUNDABLE if cancellation is received after the designated 60-day cancellation deadline. Wireless internet access is included; however, interruptions in service, although rare, may occur. Monday, 22 April 2019 is the first day that exhibitors can have technology/booth items delivered to the MPR site. The dates for the 2019 Mock Prison Riot are: Tuesday/Wednesday, 7-8 May 2019. - Booth assignments are not made until just prior to the start of the event. Clearly labeling your shipment with "MPR 2019" and your company name is sufficient information for our staff to have your shipment delivered to your booth and ready for your arrival on set up day. You do not need to label your shipment with a booth number. Actual booth assignments are not made until a day or two prior to the start of the event. Really ... we are very unique and simple show, you'll see! - Please note, again our event is very amazing yet very simple. We do not list our event with shipping companies. Please simply package and ship your freight to our address, per the shipping instructions under the Shipping section. Our facility is not active. It is decommissioned; therefore, you should not incur any additional delivery charges related to security. Following the Riot, all exhibitors must make their own arrangements for return shipping. Exhibitors must pack and label all shipments (complete with your own account numbers, bills of lading, and any/all other required paperwork).You should bring all your own shipping supplies with you such as packing materials, shrink wrap, tape, labels, etc. The Mock Prison Riot staff will not make shipping arrangements for any exhibitor and takes no responsibility for return shipping in any way. Our staff does not pack for you, complete or print out labels, call to schedule pick ups, or assume packing or shipping costs of any kind. Shipments that are packed, labeled, and ready for return - complete with all requisite paperwork - should be left at your booth. Our staff will transport all shipments to the north garage door entrance of the exhibit hall where they will remain until the pick up time(s) you schedule. Exhibitors should make every effort to schedule pick up within 48 hours of the end of the event. opportunity for vendors and end users to come together and test out the latest innovations. For years, Shooters Productions has been the media company of choice for the riots, and has consistently produced award winning production for the event. The MPR has partnered with Shooters to provide the same, high end production services for any vendor or team looking to collect professional HD footage for their marketing or training purposes... with full usage rights! Contact us to hire your own professional camera operator, with HD gear, to capture your product being used or your team executing its scenarios in broadcast quality high definition! 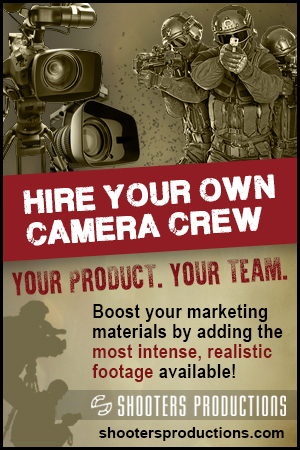 Boost your marketing materials by adding the most intense, realistic footage available anywhere. This is not stock footage...this is your product or team being captured specifically by the Shooters crew inside the scenarios, within the demo area, and inside the trade show! Don't miss out on this unique marketing opportunity. Book your crew today! A picture is worth a thousand words. A professional picture is worth a thousand more. Not everyone can afford to have a photographer on staff, but every growing company can afford to rent a dedicated photographer for a day or two...especially when the usage rights to every photo are included! This is a fantastic opportunity to gather some epic photos for your marketing materials...whether for website, brochures, business cards...you name it. This is your opportunity to have a dedicated, professional photographer on hand to capture images for you at the Mock Prison Riot! If a picture is worth a thousand words, how many words is an hours worth of video footage worth? Hint: one second of video = 30 images per second = 30,000 words every second = you do the rest of the math. Our camera operators are experienced riot veterans and will provide you access to footage of your product or team that you could only dream of. Our crew is granted unabated access to tech showcase, the demos, and most importantly, the scenarios themselves. In short, our cameras can go where no one else can. The result is a marketing department's dream. Don't miss this opportunity to gather footage that will make you the envy of your next trade show! Ever wanted to capture aerial footage of your scenario? Now you can! Hire your own professional drone camera and operator for the coolest footage you've ever seen. With the latest HD cameras and gimble mounts, the video captured by a drone is smooth and spectacular. Our drones are so stable in flight, the footage resembles material captured using a camera crane, but with unlimited freedom of movement and a minimal footprint.